A Shropshire company has significantly reduced its energy costs after being awarded a grant from a pioneering new efficiency scheme. 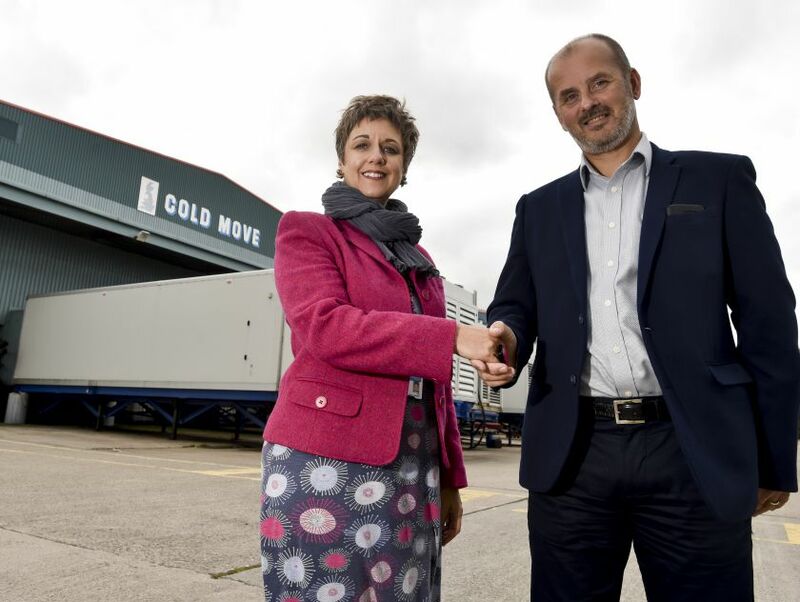 Oswestry-based Cold Move – which specialises in temperature-controlled cold storage and distribution – says it will save in excess of £15,000 over the next two years thanks to the Business Energy Efficiency Programme (BEEP). The £19,400 grant from BEEP is one of the first to be made in the Shropshire area after the launch of the scheme in the county in July. It has allowed Cold Move to install new state-of-the-art LED lighting in both head office and outside yard areas and two rapid roll freezer doors at its base on the Maesbury Road Industrial Estate. Cold Move managing director James Woodward said the measures would pay for themselves within two to three years and save around 70 tonnes of greenhouse gases each year. The family-run company, which employs 52 full time staff, received help from the Marches Growth Hub Shropshire with its application to BEEP, which is funded by the European Regional Development Fund. Mr Woodward said: “Because we have a large site which needs to be maintained at low temperatures we have a high energy demand. We were interested in the BEEP scheme as soon as it launched in Shropshire because we want to do everything we can to be as efficient and sustainable as possible. “Under the scheme, we received a free energy efficiency assessment from an independent advisor who helped us identify these savings and then applied for the grant as a result of the findings. The company had previously installed solar panels at its base to generate some of its own power, fitted LED lighting in its freezers and uses an energy management system to monitor and help them manage their energy requirements. Growth Hub Shropshire manager Emma Chapman urged businesses across the county to follow Cold Move’s example and make use of the BEEP scheme to boost their efficiency. Shropshire Councillor Nic Laurens, the cabinet member for economic growth, said: "Having only recently visited Cold Move, I think it’s extremely positive that their application has been sorted so quickly. The BEEP programme has already helped 250 businesses across Worcestershire, Herefordshire and Telford & Wrekin prior to its launch in Shropshire.